I have an embarrassingly high number of veggie burger recipes neatly tucked away in a three-ring binder in the kitchen cupboard where all my cookbooks reside. There are more on my Pinterest site where I stash all the tidbits and delicacies found on the Internet. Every time I come across one on someone’s blog, I’d gaze at it longingly, mouth watering, as I glance over the ingredients. But up until last week, I had made exactly ZERO of these recipes. The YMCA that I go to offered a Swim in to Summer challenge for the month of May; pick a ‘destination’ and swim the distance to your chosen spot. The choices ranged from 3,000 yards (Wisconsin Dells) to 60,000 yards (Bangkok, Thailand). I chose the 12,000 yard distance, the equivalence of swimming from Minnesota to New Orleans. I calculated that if I swim three days per week in the month, averaging 1,200-1,500 yards each time (48-60 laps), that I could easily finish this challenge. And declaring to push myself even more, I decided to personally tack on 3,000 more yards and swim 15,000 total yards in May. All the swimming participants have a tiny color-coded fish on the wall of the pool room that the staff moves once a week so we can see our progress. As of today, I’m at just under 10,000 yards. My little fish has been doggedly moving towards New Orleans, and before this month is out, that little laminated fish will surpass the Big Easy, figuratively swimming out in to the Gulf. So, what does swimming have to do with these burgers? ALL THE FOOD IN SIGHT. I’ve been finding myself hungry just a few hours after eating almost every day, and waking up in the night hungry, too. It reminds me of when I was in high school during the swim season, and would come home from a 3-hour practice and practically mow down the kitchen and everything in it as my Mom watched in amusement from the table. Facing down a recent swimming day, and feeling like I really needed something substantial to have for dinner, I opened my recipe books to search out a solution, and these burgers stared back at me. I had everything I needed on hand, including, miraculously, some cooked quinoa that was in desperate need of being utilized. The mixture was done in probably 15 minutes and sat in the refrigerator for about 2 hours before I shaped it and seared them to a deep brown. Griffin and I sat down to eat them, and I took the first tentative bite. They had smelled terrific while cooking. But how would they taste? Would they fall apart with the first bite? Would they be mushy? They were perfect; crispy on the outside and tender within, they had loads of flavor and a sharp, spicy bite. They held up well in a bun, too. Best of all, they really filled me up. The leftovers heated up beautifully in a pan with a bit of olive oil over the next few days, and believe me, I took full advantage of having those on hand as I finished yet another week of intense swimming. In a large bowl, place the beans, smoked paprika, cumin, oregano, salt, cayenne and black pepper and stir to combine. Set aside. Whisk together the ketchup, soy sauce and sriracha in a small bowl. Saute the carrot, onion and garlic in a skillet until lightly browned and soft, 10-15 minutes. Scrape in to the bowl with the beans and spices and using a pastry cutter or two forks, mash the beans until mostly broken up, leaving some big chunks. Add the quinoa, ketchup mixture and beaten egg. Stir thoroughly to combine. Add the Panko and mix everything. It should be moist but not soggy, and hold together when you pick some up and press it together. Cover bowl and place in refrigerator for at least an hour, or overnight. 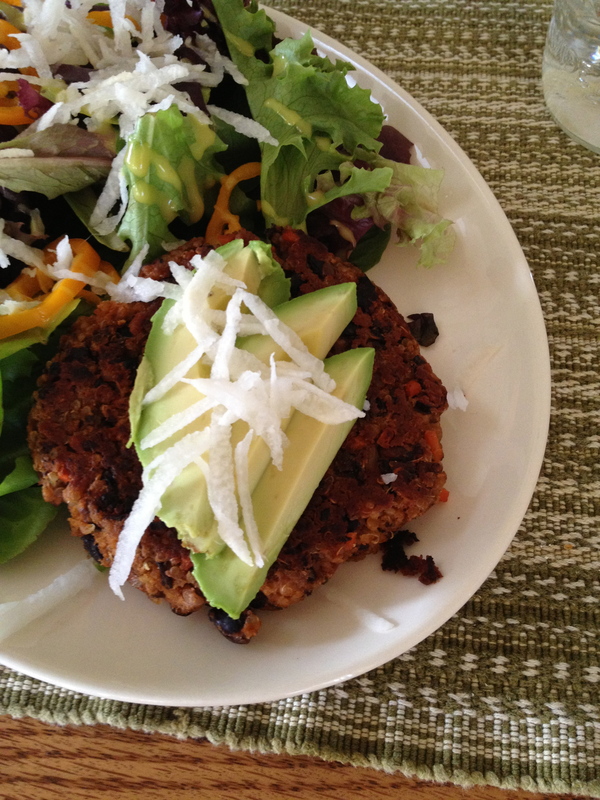 To cook: Heat a skillet with coconut or olive oil and shape mixture in to patties. You should get at least 6 good-sized patties from this amount. Cook until darkened and browned on one side, then carefully flip and cook on other side until same. original recipe from Bake Your Day. Here with heavy modifications.